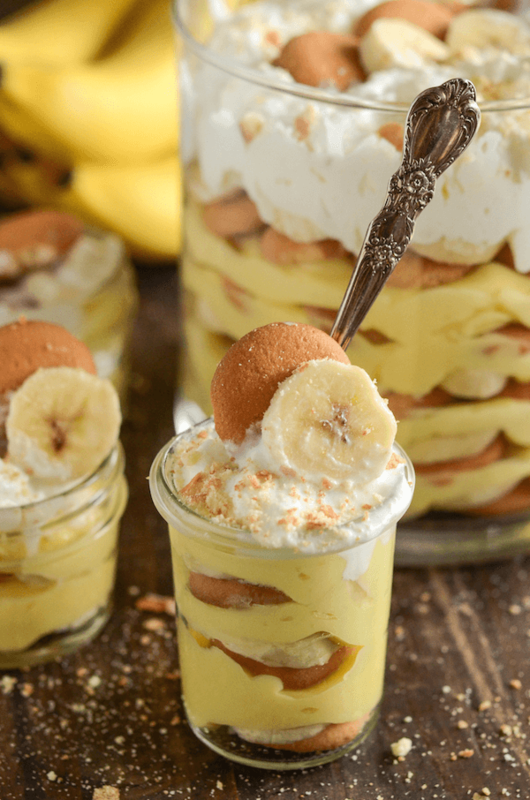 Mama’s Best Banana Pudding: creamy pudding is layered with bites of fresh bananas, sweet vanilla wafers and whipped cream in this quick classic family recipe. There are a few things that are only good when made the way my Mom makes them. 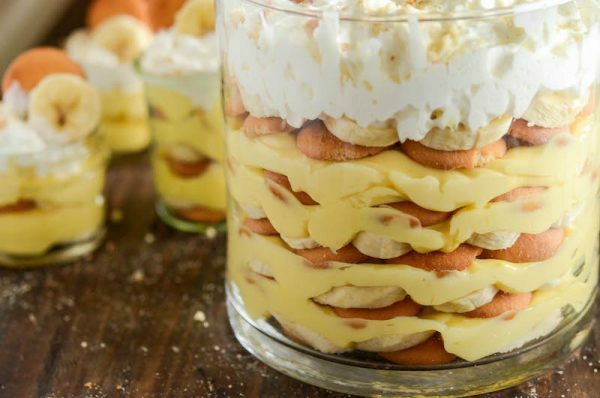 This Banana Pudding is absolutely one of them. I have tried many, many other banana puddings at restaurants and bakeries and I always regret it. It’s just never, ever as good as my Mama’s Best Banana Pudding! They don’t even come close and you would be shocked when I show you how easy it is to make. I fell for it again last week and picked up a small carton of Banana Pudding at Publix because it was on sale and I knew Jorge would be excited. We both took a bite and immediately said at the same time that it wasn’t even close to being as good as my Mom’s. Family recipes are the best for a reason. So I promised to get everything to make it the next time at the store. And I kept forgetting…and forgetting…and forgetting. Next thing I know, it’s January and Jorge is begging me to make some Banana Pudding. Literally begging. I headed to the store and picked up the few things I needed to make it and by the time I got to checkout I was drooling. I rushed home and whipped up a batch for Sunday family supper. Jorge and the girls dove into it. Ellie loved it so much she was actually dancing in between bites — it was absolutely adorable. But to be fair, that girl could eat bananas morning, noon and night. I think the secret to my Mama’s Best Banana Pudding is the can of sweetened condensed milk. My mom loves to put that sweet creamy nectar into everything she can! It’s also the secret to her famous sweet potato casserole! 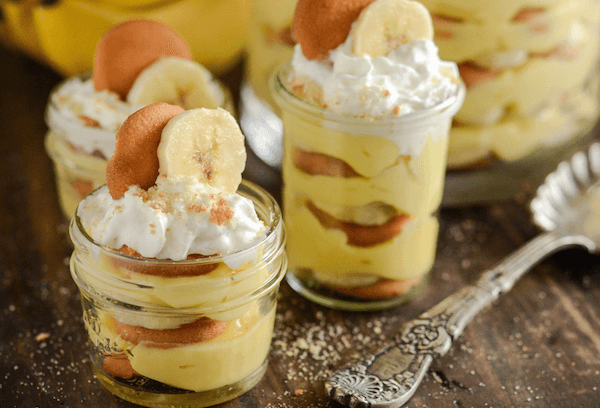 I love a ton of banana and vanilla wafers in my banana pudding and the recipe below has that. However, if you like more pudding to wafers/banana, just cut back on the wafers as you stack it. This recipe also easily doubles to fill a 13×9 and feed a crowd! You can serve it in a big beautiful trifle bowl (my favorite way!) or in individual mason jars. I also like to save cute jars from pickles, olives and yogurt to serve my trifles/puddings in. It’s a very cute, accletic way to serve them! I hope you enjoy this family recipe for Banana Pudding as much as we have over all these years! I promise it’s the best! Recipe note: The trifle bowl in the background is this awesome one from amazon. It’s footless so you can’t knock it over (been there, done that) and it has a lid for travel/storage. Love it! Recipe Note: Some people are confused by this recipes use of instant pudding. You use the dry pudding mix and mix it with the ingredients listed. You do NOT make the pudding and then add in the extra ingredients. Watch the video right above the recipe to see what I mean! In a large mixing bowl, whisk together powdered pudding mix, milk and condensed milk until smooth. Let sit for 3 minutes. Fold in whipped cream until smooth. In a large bowl (or individual parfait glasses) assemble the pudding. First, lay one third of Nilla Wafers across bottom of the bowl. Top with one third of the banana slices. Cover with one third of the pudding mixture. Continue with two more layers, reserving a few vanilla wafers to lay across the top as garnish. Cover pudding and let it rest in the fridge for at least 2 hours before serving. Can be made up to a day ahead. 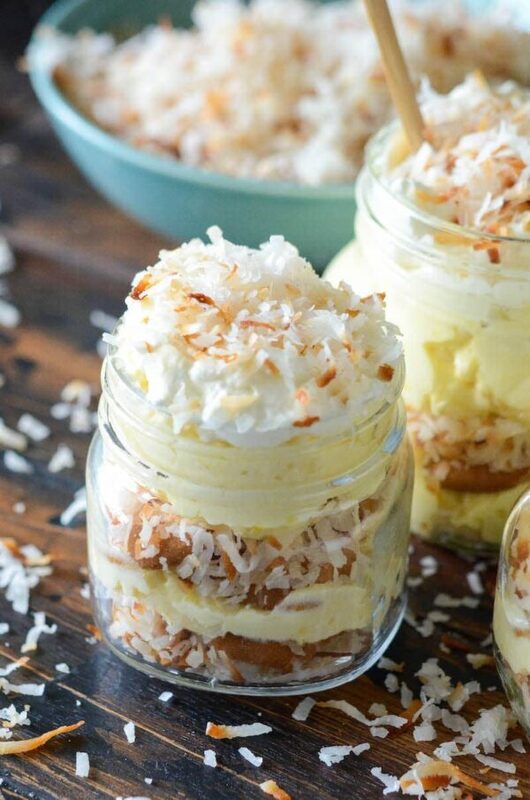 If you love this recipe for Banana Pudding, make sure and check out my favorite Toasted Coconut Cream Pudding! I love banana pudding! And your Mama’s version sounds PERFECT! Uh, LOVE banana pudding! The day before I had my first son, my best friend invited me over for dinner and served banana pudding for dessert. I knew it was the last time I could really pig out, so I ate THREE bowls! It is truly one of my weaknesses. I have been dying for a good banana pudding recipe and with your mom’s addition this might be it. I ADORE banana pudding, and have never made it. Definitely bookmarking this one! I just love banana pudding!! This looks so creamy and delicious! Oh I love how this is put together individually. I was never a fan with banana pudding in a whole casserole because it made the cookies soggy. Love that this can be put together right before serving! I love this semi-homemade pudding. I love chocolate more than bananas, so you won’t mind if I add a bunch of chocolate or use chocolate pudding, will you:)? My mom also puts sweetened condensed milk in everything. It just tastes so good! Mamas know best 🙂 This banana pudding looks excellent! When I saw this post, my mouth watered. I want some now! I haven’t had banana pudding in forever! I’ll have to give this a try, it looks so great! I made this over the weekend for my families Sunday dinner. There are 22 of us, so I made a double batch. It was GONE! Everyone LOVED it! Thanks so much! When you say mix the pudding milk etc do I make the pudding according to the package first ? Hi This looks Devine! I live in South Africa. You say “Vanilla Wafer Biscuits”. In the photo your biscuits do not look like our wafer biscuits. Ours are layered. The biscuits in the picture look solid. Is that correct? Hi Maureen, I’m south african too but I live in the USA now. You could probably use Marie biscuits. I can’t think of any other close substitute to vanilla wafer biscuits. They’re kind of like thick Marie biscuits, not at all like SA wafers. Hope that helps! WHat does Fold in mean??? “Folding in” is just gently mixing the ingredients. Instead of short quick spoon stirring, use longer slower strokes. Hi Courtney! Did you use the large box (5.1 oz size) of instant pudding? It definitely shouldn’t be anywhere close to runny! How much does this recipe make? I don’t have a large bowl to use so was going to use a 13×9 baking dish. Will that be too small and I should reduce the ingredients? So looking forward to making this and love that I don’t need to wait hours to eat it!! You could use a 9X13! 3 cups whipped cream/cool whip is NOT that much liquid to make it runny. Did you perhaps use un-whipped cream? And if it’s not that – did you use the giant box of instant pudding? I made this again this weekend for a family gathering and it definitely was not runny! I made this today for a work potluck for Memorial Day. I had 8 people come ask for the recipe!!! Made this Monday for a party. It was so yum. First dessert fully gone. Not sure what people are doing to make theirs runny. Maybe not using instant pudding? Mine was perfect. Definitely not runny at all. I’m pretty sure people are using “whipping cream”. Not whipped cream. they must be folding in just the liquid and not whipping it first. Made it this weekend…not runny at all. That is my thoughts too! Hope you enjoyed it Bryn!! Is the pudding banana flavored? Or is it vanilla pudding with bananas in there? I’m a little confused about how it becomes yellow banana pudding…. It’s just vanilla instant pudding – it’s yellow. The banana flavor comes from all the fresh banana slices! Hi…what does it mean by fold in? Hi Maritza, Folding is a very gentle way of mixing additional ingredients into a batter/mixture. It just means to gently stir in the whipped cream/cool whip. Our banana pudding was runny as well. In the directions, could it be more clearly stated to not make the pudding separately before mixing it in? Should have read the comments before. We still love our banana soup! I’m sorry, I thought it was clear, but I have now added an additional note for anyone else who is confused. It is the dry pudding mix that you mix in the listed ingredients with. Hope you try it again! How many individual 6-8oz cups would this recipe make? Hi! I just made this and it was amazing!! I was wondering if you knew how long it would last in the refrigerator before going bad? It made a huge batch and I will not be able to eat it all today (or tomorrow probably)! Thanks for your response! This was a great recipe, thank you for sharing. I made this for a family gathering where we had a desert contest and it got first place! This was my first time doing anything like that and everyone loved it! That’s awesome! So glad you enjoyed it Sarah! BEST banana pudding EVER !!!! BEST banana pudding EVER !!! I made this for my son’s 3rd birthday curious george themed party and it was a HUGE hit! I think I’m gonna try this with chocolate pudding sans bananas. That sounds adorable!! Glad the banana pudding was a hit! This is my new go-to banana pudding and it is so GOOD…I halved the recipe straight down the middle (cause I live alone), and it still turned out TO DIE FOR!!! Thanks for sharing! Ha! I could eat the entire recipe all on my own! 😉 Glad you enjoyed it Freda! Hello, does 3 cups of cool whip mean 3- 8 oz. containers? 8 oz. to me is a cup. Sorry if this is a stupid question. LOL! Marta, I would spoon the Cool Whip into a 1 cup measuring cup with a handle just to make sure it is the right amount. Coolwhip works out a little differently when measuring. I would recommend buying and using a 12 oz container of Cool Whip! Hi Darien – It’s 3 cups of whipped cream or coolwhip – so already whipped cream, it would be more like 10 oz of heavy cream before being whipped, not 24 oz. Hope that makes sense. Sorry if it’s confusing, I don’t know how else to describe how much to use since coolwhip is already whipped and whipped cream you have to whip yourself. Darien, I just update the recipe to say: 12 oz cool whip or 12 oz heavy cream, whipped to stiff peaks. This is how I had it listed before, but people were still getting confused, so I listed it in cups to try to help. Again, sorry for any confusion and for the loss of ingredients — I hate that! I remade it and it’s perfect with the 12oz container of cool whip!! Thank you!! It says the big pudding mix (5.1oz) but the big pudding mix I bought is actually 1.5 oz so do I need to buy more or was that a typo? Mine turned out incredibly thick and doughy, despite following the recipe and instructions to a T. The flavor is great, but the texture is all wrong. I’ve continued adding more whipped cream and milk and it seems to be thinning out some. But I’m calling it quits for tonight and will see if it can be salvaged in the morning. What does “Fold in whipped cream until smooth” does that mean make the pudding then add the whip cream on top and start layering? Fold is how you mix it. You stir the whipped cream in with slower, longer strokes as opposed to rapidly stirring or mixing. The pudding is used as a dry ingredient. You don’t prepare the pudding according to the box directions. Just use the powdered pudding and add the milk and sweetened condensed milk to it. I’m not sure if it’s different brands of pudding or what, but it seems some peoples turns out yellow and some more creamy white. I use the standard jello brand of vanilla pudding and it always turns out yellow tinted for me! I was wondering the same thing. I used the exact same jello pudding and mine isn’t yellow at all like the pictures. It looked to me like your trifle in the video wasn’t as yellow. It looked the same color as mine, like an off white. I too want that yellow color in the small mason jars. It looks delicious! I want to try it but I live in the Middle East and I am not sure if I can find instant vanilla pudding mix. Do you know how can I replace it? Thank you!! Hi Joanna! You can make homemade vanilla pudding and use that in place of the instant! Pingback: Budete sa zalizovať: Banánové poháre so salkovým krémom! Does this recipe fill a trifle bowl or should I double it? I noticed you had lots of layers in your picture. It will fill a regular sized trifle bowl! This was may first try at a banana pudding! The recipe was easy to understand, and easy to make. I made individual banana pudding cups for a Black history event at church. They loved them, young & old! Delicious just like Mama’s. So glad everyone enjoyed it Dawn!! If you make the individual cups how much does the recipe serve? Wondering if I should double the recipe to make about 20-25 individual cups. Hi Ena! Yes, I think you would need to double the recipe to make that many cups! I did not have the sweetened condensed milk..I used evaporated with water for the milk one time and a can of straight evaporated and regular milk and a can of evaporated the second time. It was very well received both times, some said they preferred it to the sweeter tasting sweetened condensed milk. Anyway, a great recipe..
Hi… any recommendation on the ripeness of the bananas? Planning to make this for Mother’s Day and trying to determine how far ahead to buy my bananas. I’m thinking they shouldn’t be TOO ripe, but they need to be ripe enough to have some flavor. Would love some thoughts on this very important topic! If you put any on top, yes, but if they are all inside the layers they shouldn’t turn super brown since the air won’t be getting to them. I know you mentioned using a regular sized trifle bowl but do you have an ounce size? Sometimes serving bowls have an exact size and want to be sure I buy the right one! Thank you! Hi Lauren, I use a 9 inch trifle bowl. It’s approximately 120 oz! I made this for dinner tonight. I used the whipping cream vs. Cool Whip and it was delicious! There was none left! I made this recipe today for my son’s birthday, came out perfect! Super yummy! Thanks for sharing. How many individual cups does it make. What size cups? This Banana pudding was great, just a little bit to sweet for me , but my husband and daughter loved it!!! Hi Jessica, Can I use Banana Cream pudding instead? I always cook my pudding, the difference in the taste and texture can’t be matched by instant. And since I learned the no muss, no fuss way to make it in the microwave it is done in almost the same time. Have you tried banana pudding in place of the vanilla? I am from South East Asian country and we do not have vanilla wafers. What can I substitute with ? I don’t bake much and tried this recipe for banana pudding tonight as dessert for Sunday dinner. 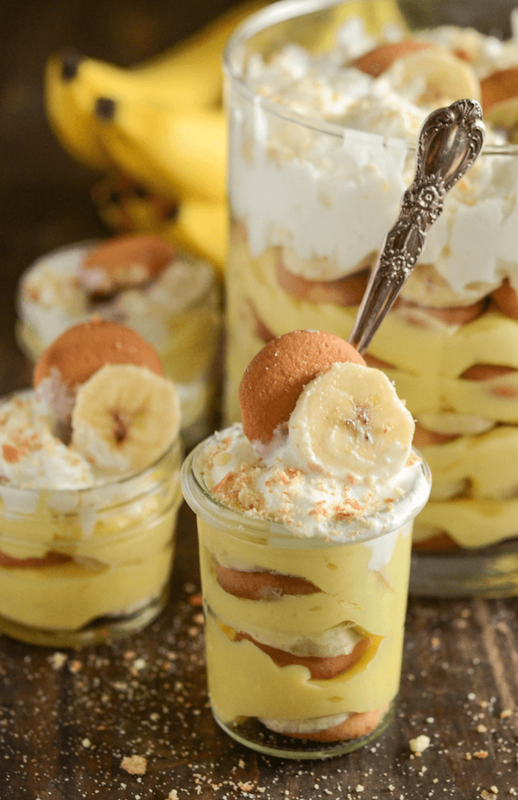 My husband wanted banana pudding and after reading this recipe and bio….I really wanted to try it. First off, this is so quick and easy to make! The mix tastes so good that my kids and husband were licking the spoon and wish after. Secondly, adding it all together was super easy. All of my family member said they want to try it. This was delicious and hit the spot for my family. Thanks so much for this recipe. It was really appreciated! The instructions say to fold in the whipped cream to the pudding mixture, but your picture seems to have layers of whipped cream in addition to the layers of pudding. Do you set aside part of the whipped cream called for in the recipe, or use more whipped cream above the 12 ounces listed? Saw your recipe and decided to try it. It was so simple and a HIT. Thanks for sharing it. Hi Jessica Making it for friends tonight – how many serves would there be? – making it in a bowl. Thanks. I never take the time to post comments on blogs HOWEVER i have to for this banana pudding recipe! I made this for my entire family for mother’s day BBQ amd i was Crowned the new banana pudding queen! My dad said this tastes just like the pudding he remembers as a kid. I’m a little embarrassed to say we ate the entire double recipe in less than 24 hours! So delicious! Thank you thank you!!!! Amazing banana pudding! Before making this recipe I had never tried banana pudding before, I’m hooked now! I found your recipe when searching for other ideas to use my ripened bananas in besides banana bread and I was not disappointed. During strawberry season I used the vanilla pudding mixture (instant pudding, milk, sweetened condensed milk and freshly whipped cream) and layer with vanilla pound cake and strawberries for an amazing strawberries and cream trifle, I highly recommend trying it! If I make homemade whipped cream do I add the powdered sugar and vanilla like I normally would or do I just whip the cream and not add sweetener before mixing it in? Hi Heather! I would add the vanilla and a couple tablespoons of powdered sugar, but you don’t need a ton of sugar. It’s already sweet from everything else! Very straightforward, simple to make and delicious. I have this recipe on my regular rotation for get-togethers. I’ve never even had banana pudding before but want to try this! My question: Is banana pudding best made only a couple hours before serving so the wafers will still be crisp, or is it supposed to have softened wafers? If I make it like 6 hours before the party, will that be enough time for the wafers to soften? Best vanilla pudding ever. I making it for the 2nd time now. Didn’t last long the 1st. If done a day before won’t the banana turn brown? Yummy — Just had cervical spine surgery and can’t swallow much. Banana pudding is a special favorite. Hopefully I’ll be able to eat it!